Well it looks as if the season on the West Branch is rapidly approaching the end. As of right now Cannonsville has begun to turn over, so the discharge water is stained as they like to say up that way, with just a few inches of visibility. Sure you can still move fish, but I imagine you have to put it right on their head! This past weekend we were able to sneak away for a quick float - and I mean quick. We did not get on the water until 4pm, and with the heavy overcast and rain, dusk came very fast. Although the conditions were far from optimal, we still thought we had a good chance to get into fish. Overcast, rain and off color water generally means good stream action. That said, we only landed one - far short of our expectations. Fly of choice for the streamer action continues to be anything large and white. We are talking flies over 5' in length. As we look into October, more rain is on the way in the short term, but hopefully it is not too much, so we can at least salvage at least one fall outing on the Lehigh. 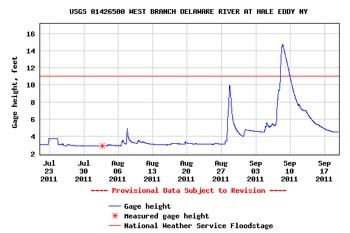 It is interesting to note that the Hale Eddy gage on the West Branch of the Delaware reached about 15' after the flooding rains of Lee swept through. 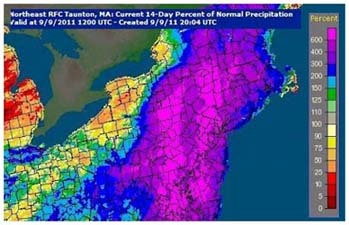 For the most part the Delaware watershed below the dams were spared the worst. 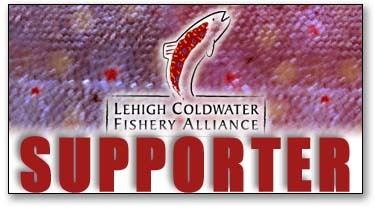 Unlike upstream of the dams or what occurred in the Susquehanna River Basin. However, even though that area was spared the worst Hale Eddy did crest at its second highest level ever since Cannonsville Reservoir was built (1964). Obviously the highest crest post-dam construction was back in 2006 when the river crested at over 19'. Computer issues shut us down for a little bit, but now we are back up and running for the fall bite. Hopefully everyone managed to make it through the remnants of Lee just fine and without much in the way of damage. Fortunately all the waters have receded by now, though they are definitely running a bit high. Especially the larger waters. Also, it looks like a little taste of fall is on the way beginning late in the work week. Frankly this is not a moment too soon. 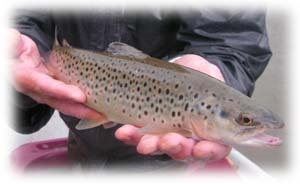 This summer has been a rough for the trout angler due to the heat and lack of rain except for the coldest of limestoners and tailwaters. After all the rain and flooding, it was time to check out a local limestoner to see how it weathered the storm (Irene). It would be an understatement to say it looked like the stream bottom was power washed. The majority of the larger mid-stream structure rocks were scrubed clean, and the amount of newly deposited gravel/sediment was impressive. As for the fishing, it was not all that great. Hopefully the fish are still there, but in times of extremely high water there is certainly no doubt that mortality does occur. On this day the fish were not all that eager to eat a bugger although a few did hit short. One was a very small brown which was good to see. Along the way I did notice some fish being kicked out of some of the deeper holding water. Bug life, what little there is left of it, quite possibly took a hit. It will be interesting to see how the fishing reponds as we work our way through the fall.